Depuis sa fondation au début des années 1840, plus de quarante ans s’écoulèrent sans que la cité coloniale de Victoria à Hong Kong ait disposé d’un vrai centre architectural ou d’une grande place centrale encadrée de bâtiments prestigieux. L’une des raisons tenait au fait que dans une colonie qui était à l’origine, et qui est restée depuis, essentiellement une cité portuaire construite sur le bord d’une île montagneuse, les étendues de terrain plat étaient quasi inexistantes. Cependant, en l’espace d’une quinzaine d’années, vers la fin du règne de Victoria, un vaste programme de poldérisation eut pour effet de faire reculer le front de mer. Et c’est au beau milieu de ces nouveaux terrains que, petit à petit, sans grande vision d’ensemble, le « Statue Square » vit le jour. Tout autour de la place, de splendides bâtiments de style colonial furent construits et complétèrent un ensemble architectural que l’on peut lire comme la fière signature de l’époque victorienne. Le présent article examine le processus qui donna naissance au « Statue Square » et les valeurs symboliques incarnées dans cette place. 1 The Time Out Guide to Hong Kong, Jonathan Cox (ed. ), London: Time Out Guides Limited, 2001, 63. History? What history? […] “Central” is the epitome of here-and-now Hong Kong - the few remnants of its colonial past that survive are little more than scraps, which inexorable development and land reclamation have left marooned among the towers of steel and glass1. 2But to those whose have the determination not only to find some “scraps” of the past amidst today’s “towers of steel and glass” but also to make sense of what they find, I would recommend a visit to Statue Square. Few other sites in this city of over seven million people carry as much colonial “baggage” as this one. Of course, many imposing individual buildings not directly on the square, like the Anglican cathedral, Government House, the Old Magistracy, and scores of others, may have much more to show tourists, and their architecture is a powerful testimony of Hong Kong’s colonial past. But this square – precisely because it is an empty space in the heart of a city which, squeezed as it is between mountain and sea, has always valued developable land as the ultimate source of wealth and revenue, can rightly claim some priority on the “must-do” list of a historian’s investigations. 3Like all formal squares in any city of the world, it is a legacy from the past. It has a meaning, or at any rate a message, to impart about the forces which made it not only possible but also permanent enough to have been preserved, virtually unchanged, for over a hundred years. At some stage, decisions were made, if not to create an empty space, at the very least to stop building on what once was land available for development. Tracing the forces which combined to create this square is the aim of this article. The main developments which shaped these forces coincided with the Colony’s preparation for the Diamond Jubilee of Queen Victoria. It is therefore likely to provide an interesting model to study the roles played by the various sections of the colonial community, and the way they pulled together to realize a grand imperial project which was never planned as such and which, surprising as it may seem, arose on a piece of land which did not exist a decade earlier, having only just been reclaimed from the sea. 4It is best first to give the reader a description of the square as it is today. As will be seen from the following map (green area hatched in blue lines), Statue Square forms an irregular rectangle of roughly 200 meters in length by a maximum of 150 meters in breadth to the north, and a minimum of 100 meters in breadth to the south. 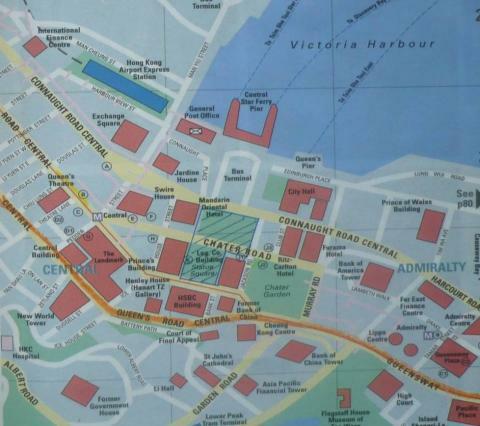 A street named after the principal Victorian developer of this district, Chater Road, crosses the middle of the square from east to west, roughly parallel to the sea shore and to Queen’s Road (coloured in orange on the map below). The square is flanked by several landmark buildings. Immediately to the south, stands the modern headquarters of the Hong Kong and Shanghai Bank designed by Norman Foster in 1985 on a site fully owned by the bank since 18822. The bank building faces the harbour to the north, though its address, reflecting its original entrance to the south, has been No 1, Queen’s Road, ever since it started operating in 1864. 5On the west side of the square are two modern buildings – the commercial Prince’s Building to the south of Chater Road, and the Mandarin Hotel to the north. 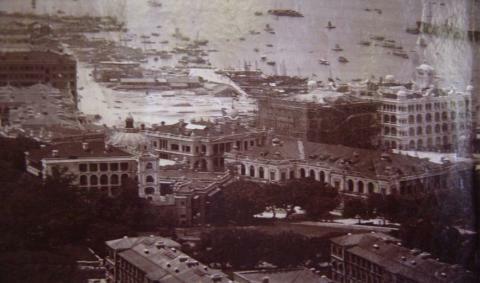 Facing the Mandarin Hotel, to the east of the square (unmarked and in grey on the map below), stands the modern building of the Hong Kong Club, which was founded in 1846 and moved to its current location in 18973. 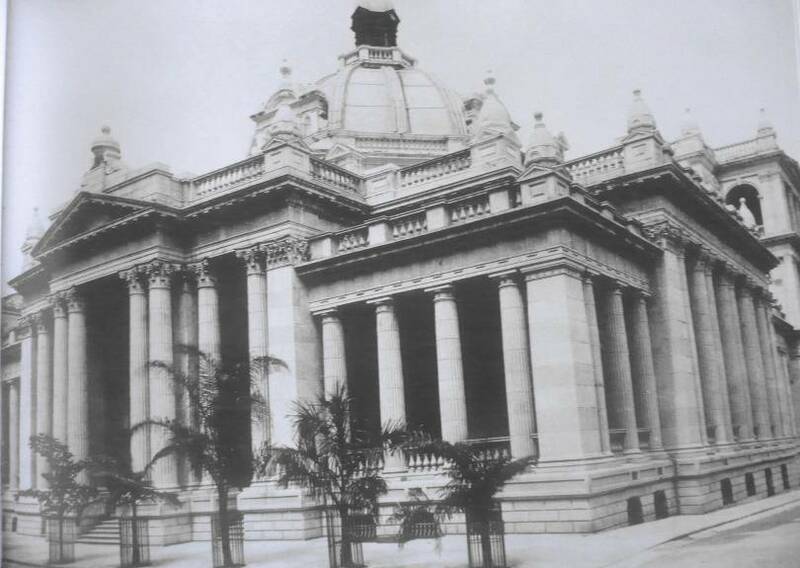 6Finally, facing the Prince’s Building on the east side of the square, stands one of the most elegant buildings dating from the colonial era – the Supreme Court building, completed in 1912 and since 1997 the seat of “Legco”, the Hong Kong SAR Legislative Assembly. 7In short, out of the five principal buildings which currently flank Statue Square, only one – the Legco building – was built during the period of our investigation. The other four – the Hong Kong and Shanghai Bank Building, the Prince’s Building, the Mandarin Hotel and the Hong Kong Club – are contemporary or modern replacements of previous structures. But, leaving aside the appearance of the buildings which surround it, the square itself has hardly changed since the end of World War I, except for one addition and one crucial modification. The addition was the erection of a Cenotaph on a lawn just in front of the Hong Kong Club. And the modification in the lay-out was the disappearance of a wide alley which crossed Chater Road at right angle right in the centre of the Square and which provided the focal point where the monument to Queen Victoria once proudly stood. 9To appreciate the sea change which, during the last forty years of the 19th century and more especially in the decade 1887-1897 between Queen Victoria’s two Jubilees, transformed the appearance of the city5 and gave it the “centre” it had previously lacked, it is first necessary to introduce a road and a concept. The road is Queen’s Road, and the concept is that of “Praya”. 10As usual, practicalities were paramount when it came to building a city from scratch, which was the situation the British faced in 1841 after taking possession of Hong Kong island. The initial colonial government started raising revenue by selling land – or more precisely long leases on the land. The most valuable sites were naturally on the harbour front, facing the peninsula of Kowloon a short distance across the harbour to the north. The lots sold on the sea front, or “marine lots”, gave their owners direct access to the sea. As most of the owners were merchants, many built their godowns, shops and store-rooms on their marine lots, which greatly facilitated the loading and unloading of ships at their own piers, and gave them competitive advantage over other merchants less conveniently located. Right from the start, therefore, the harbour front was entirely taken up either by commercial activity and individual piers or by the Royal Navy’s docks. The consequence was that neither pedestrians nor carriages had a right of way between the water and the godowns. 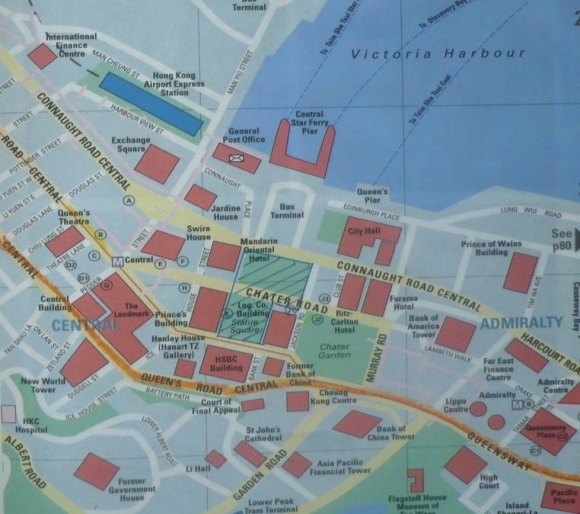 No planner had thought of establishing a thoroughfare directly on the harbour-front which would run the three-or-so miles which was then the full extent of the city, between Causeway Bay to the east and Belcher’s Point to the west. 6 This map was drawn in 1882 by Osbert Chadwick, an officer in the Royal Engineers. 11Instead, what gradually developed was a lane, and later a road, of roughly the same length as, and parallel to, the harbour-front, and situated at a distance from the sea which roughly reflected the depth of the marine lots. That road became known as Queen’s Road and, as can be seen in red on the following early map of the colony6, it became in fact the “Main Street” of Hong Kong. 12Owners of marine lots had therefore two exits to their premises – one by boat to the harbour, and one on foot to the city via the long, winding Queen’s Road. As an illustration of this point, a red X sign on the map indicates the exact site where the Hong Kong and Shanghai Bank first operated and which it later acquired. The reader will rightly conclude that the bank was built on one of the original marine lots, and that, to the north, the building had direct access to the sea, whereas its southern entrance was on Queen’s Road. 13This conclusion would be completely right, were it not that in 1882, the date of map, the “Praya” had been completed, which already gave Central Hong Kong as seen from the harbour a most elegant look, though, as we shall see, not yet the imperial panache which later came with Statue Square. 14The term Praya usually goes unrecorded in English dictionaries or in standard English-language encyclopaedias. It is originally a Portuguese word which means the equivalent of “a sea-front promenade or thoroughfare” usually lined with smart, substantial houses. The most famous colonial Praya in the Far East, and a model to be imitated, was located a short distance from Hong Kong, in Macao. And the British simply borrowed both the word and the concept when they decided to have their own Praya in Hong Kong. 8 Trea Wiltshire, Old Hong Kong, Hong Kong: FormAsia, 1997, 30. 15Building a Praya certainly indicated a desire to introduce a modicum of government planning unknown in the early laissez-faire days when the city, and in particular its harbour-front, had originally developed. It also involved persuading the defensive marine lot holders to give up their exclusive rights to the harbour front and to their own piers, and building a wide thoroughfare in front of their houses for the benefit of the general public. Eventually, the idea first mooted by Governor Bowring (1854-1859) was accepted and “the bulk of construction and extension works on the Praya were undertaken between 1859 and 1867 7”. As a result, many prosperous marine lot owners resolved to improve and modernize their buildings, and, as can be judged from the following photo taken in the 1860’s 8, the result was as pleasing to the eye as it was convenient to the city-dwellers who now had unrestricted access to the various piers of the Central District. 16With the completion of this new harbour-front road, Hong Kong now had two parallel roads in the Central District – Queen’s Road, and the Praya. For about twenty-five years, from the 1860s to the 1880s, the Praya gave the arriving traveler this unforgettable first glimpse of the city of Victoria. The proportion of the sea-front buildings, their elegance, combined with the functionality, provided the proud façade which the colony exhibited to the overseas visitor. The Chinese hovels of Tai Ping Shan, only a few hundred yards away up the hill, were conveniently hidden from view. Such was the dignified view which greeted Prince Alfred in 18699, on his stop-over in the colony during his round-the-world voyage in his sailing ship Galathea. 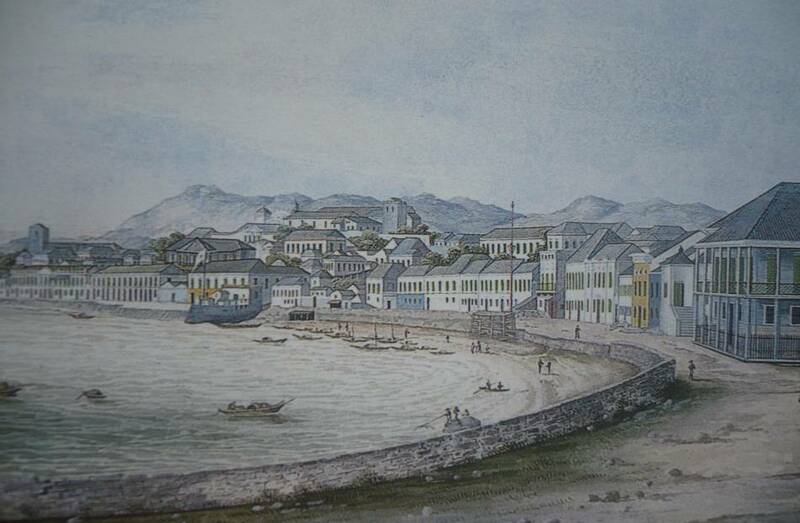 He was the first relative of Queen Victoria to visit Hong Kong, and he was most impressed. 17During his visit, the Prince opened the newly erected City Hall10, a splendid public building situated on a marine lot adjacent to the Hong Kong and Shanghai Bank. 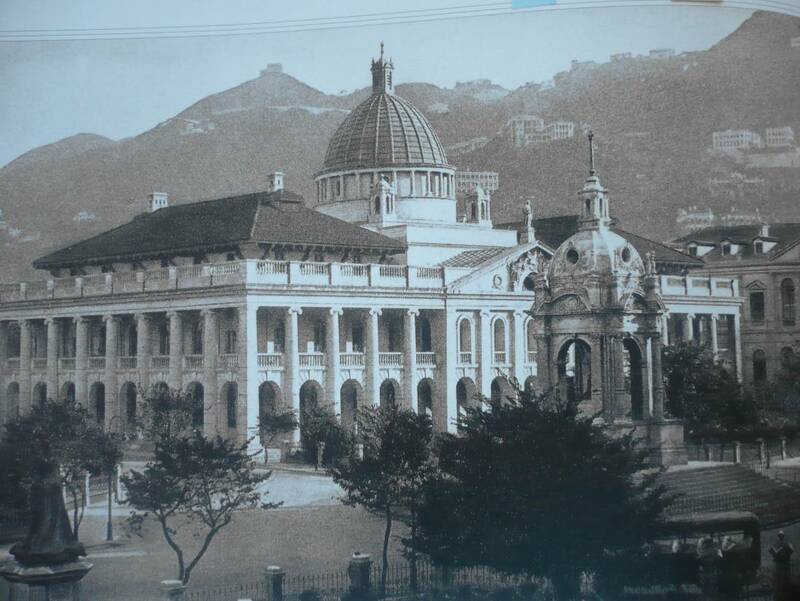 City Hall soon became the hub of expatriate cultural life until its demolition in 1933. It featured a museum, elegant rooms for entertaining guests, and a grand theatre where concerts and plays were regularly performed. 11 See I. Lambert & G. Chambers, op. cit., 22. 18Thus, by the middle of the 1880s, after forty years of existence, the city of Victoria had no architectural focus. It had no central square, no public place where its minimal government and its colonist community could celebrate their joint achievements, indulge in a symbolic display of patriotic fervour, and bask in the glory of belonging to what they believed was the greatest nation on earth. What it had in the Central District by way of flat, open spaces was extremely limited and served other purposes. The Murray Parade Ground, located just below the Cathedral and created in the early years of the colony by flattening an inconvenient hill, was reserved for exercises by the Army and the Police. 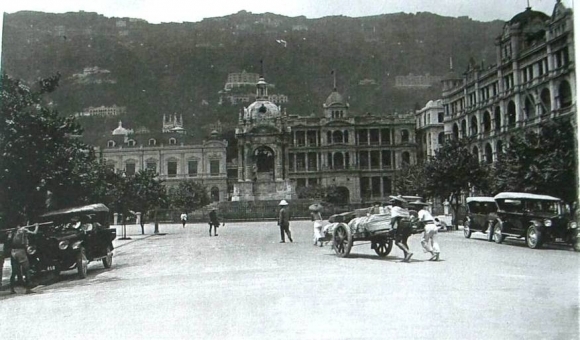 And the Cricket Ground (now “Chater Gardens”), next to the Parade Ground and the very first reclamation site in Hong Kong dating back to 1851, was hallowed turf only to be used by members of the Cricket Club11. 19Apart from its natural harbour, all the city had to send the world as an image of itself was a congested three-and-a-half-mile-long Queen’s Road and an elegant-looking sea-front Praya. But the Praya did nothing more than re-create the façade of opulence previously found in places like Macao and, earlier still, in the proud fronts of the foreign factories in Canton. It was nothing much more than a Victorian continuation and adaptation of the “merchant princes” tradition of architecture applied in a colonial environment. The Praya could be and was used by members of the general public but this was not its main purpose. Like Queen’s Road, it was also a busy street where merchants had their headquarters, and where ships endlessly loaded and unloaded cargoes and passengers from across the harbour alongside crowded piers. It was certainly no “Promenade des Anglais”. 20Within twenty years, the architectural signals which the city of Victoria was to send to the world about its identity and its significance within the British Empire were to undergo radical changes including a land-reclamation scheme on a scale never seen before, and a new building development programme to match. This would not have been possible without the vision and the business savvy of an individual by the name of Paul Chater, and the combined powers of benign government, of finance (the Hong Kong and Shanghai Bank), of influence (the Hong Kong Club), and of “the Rule of Law” (symbolized by the Supreme Court building). 21Paul Catchick Chater12 (later Sir Paul) was by far the single most important businessman in Hong Kong during the late Victorian period. Today, in recognition of what he did to transform the heart of the city, his memory is preserved in both the Chater Gardens (formally the Cricket Ground) and in Chater Road which cuts through the very middle of Statue Square. 16 B. J. Hudson, op. cit., 134. 23The total cost of the project came close to three million dollars, a very large amount at the time15. The government had been happy to endorse the plan largely because it was to be almost entirely financed by the owners of the marine lots, who admittedly had to pay between two and three dollars per square foot of building land for their share of the reclamation, but could later make three or four times their money on resale, and up to ten times in some parts of the Central District16. In time, the Praya reclamation project turned out to be a great financial success for most of the marine lot owners. 25Paul Chater had been appointed chairman of the 1887 Jubilee Committee. It was from this platform that he had launched his campaign for the Praya Reclamation. By 1896, he had become one of the two non-official members appointed to the Governor’s inner cabinet, the Executive Council. Once again, he was asked to chair the Jubilee Committee – this time, for the 1897 Diamond Jubilee. The stakes had never been so high. As preparations went ahead, one of his new buildings – the Queen’s Building – was nearing completion on the central reclaimed land where he was planning a number of truly imperial occasions. 26First, he planned for a grand unveiling of the new statue of Queen Victoria to take place on 28 May 1896. The statue had been commissioned by the Jubilee Committee, and it was to be installed right in the middle of most precious and central part of the reclaimed land, under a monumental stone canopy in the form of an imperial crown. No grander statement of Victorian imperial supremacy had ever been conceived in Hong Kong, and it was remarkable that whilst the colonial authorities were most happy to endorse the project, they had not been the prime instigators. A year later, of course, were to take place in Hong Kong, as indeed in the rest of the Empire, the Jubilee celebrations proper, spanning four festive weeks from 19 June to mid-July 1897. Paul Chater was in charge and things were moving apace. 28However, bankrolling economic development and looking after people’s savings has always been a perilous exercise based entirely on trust. As a result, bankers, more than any other businessmen, have always tried – though not always successfully – to project an image of prudent conservatism. They have also tended to build their headquarters as architectural statements symbolizing that solidity in the hope that symbol and reality can reinforce each other. The first headquarters erected in the city of Victoria by the Hong Kong and Shanghai Bank is a good illustration of this phenomenon. The large main door is gained by ascending two small flights of steps, which land us on a level with the veranda formed by the colonnade that runs round the whole building. Passing in it at the main door, we find ourselves in the bank proper – and immense hall which might be considered as a building apart from the rest. It is roofed by a large octagonal dome, the apex of which is 100 feet above the floor. This dome rests on arches supported by eight massive Corinthian pillars of polished red Aberdeen granite, and is lighted by a series of circular windows filled with stained glass19. The building from this side appears as a solid three-storied structure, the ground floor of Doric architecture, the first floor Corinthian, and the upper floor composite, forming altogether an imposing and beautiful classical design20. 31The Hong Kong and Shanghai Bank’s contribution to Statue Square had thus initially been unplanned and unforeseen, its building having been erected a good ten years before the reclamation of the land in front of it. Yet, the combined foresight of its manager, Sir Thomas Jackson, and of the governor of the day, Sir Henry Blake, saved the site immediately in front of the headquarters as an open site in perpetuity. This area of reclaimed land was made up to four buildable lots: two belonged to the bank to the west, and two were owned by the government to the east. These lots extended to the north as far as Queen Victoria’s monument. In 1901, the government struck a deal with the Bank. It was prepared to give a pledge never to build on these lots, so long as the Bank itself was happy to make a similar commitment. The Bank promptly agreed to the proposal and confirmed that “the site should remain an open space for all time”21. 32The following year, Chater and his friends offered the city statues of the new King, Edward VII, and of the Prince of Wales. The new statues were added to those of Queen Victoria and of the Duke of Connaught. Statue Square which had been established as the focal point and symbolic heart of the city of Victoria five years previously during the Diamond Jubilee year, was now confirmed as a space barred from future development and dedicated to the exclusive celebration of what, at the time, was triumphant British imperialism. 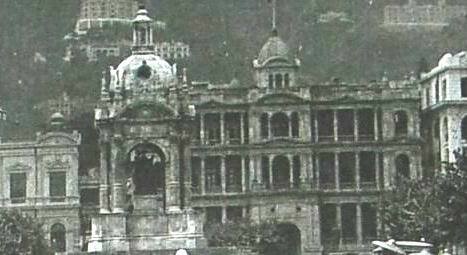 33By the time the Hong Kong government and the Bank signed their historic agreement, the Hong Kong Club building had graced the east side of Statue Square for just four years. Before its construction, the east side of the reclaimed land which came to constitute Statue Square had been completely bare. In time, two new splendid buildings were to fill the gap – the Hong Kong Club to the north, completed in 1897, and the Supreme Court to the south, completed in 1910. 22 See Hong Kong Club (ed. ), op. cit., 9 ff. 34The Hong Kong Club is the oldest, most venerable of the many social clubs in Hong Kong. It is almost as old as the colony itself, having been founded in May 1844. By 1846, the original members had acquired a plot of land at the corner of Queen’s Road and Wyndham Street, where they erected the first Club house22. Membership of the Club was always exclusive and has remained so to this day. It included the governors and the members of their councils, the heads of commercial houses, the upper echelons of the colonial service, members of the judiciary and of the professions, etc.. It was run like any of the most elitist of the gentlemen’s clubs in St James’s. Chinese members were not accepted until well after World War II, and ladies could be invited to tiffin or to dinner but could not become members in their own right. In short, the Club’s membership was a mirror image of Hong Kong’s elite society of the day. Members shared all the prejudices of colonial society – veiled (and sometimes not so veiled) racism, a sense of superiority at being white and of pride at being British, a devotion to hard work and to the pursuit of riches, but also, in many cases, a desire to improve the lot of the poor, trust in progress, and a sense of fairness symbolized by a universal respect for the Common Law and the due process of Justice. 23 Ibid., 12. The purchase price of the land is not disclosed in this source. 35It goes without saying that Paul Chater was one of the leading members of the Club. As often happens, important business deals are struck in the plush atmosphere of gentlemen’s clubs. 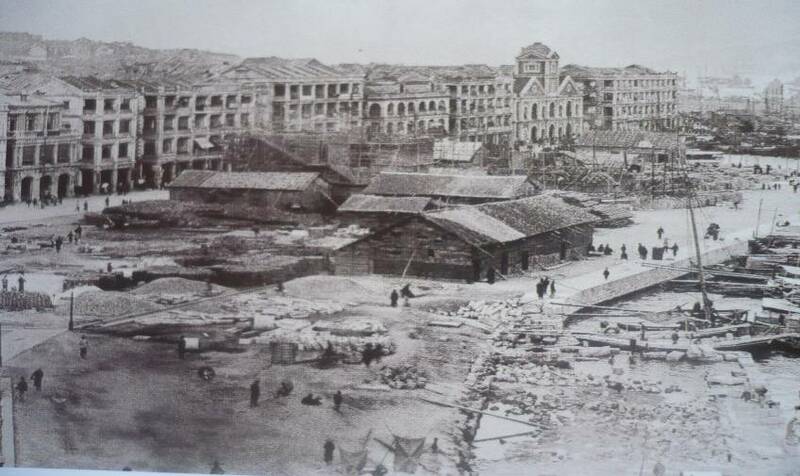 Towards the end of 1892, the Praya Reclamation work in Central which had started three years earlier was nearing completion. Meanwhile, the forty-six-year-old Queen’s Road Club house was showing signs of wear and tear, and above all it was getting too small for the enlarged membership. The solution was obvious: why not buy a large new lot on the reclaimed land, and build a truly splendid new Club house there? A general meeting of the members was called on 20 October 1893 to discuss the proposal. The meeting chairman emphasized the suitability of the site, right on the new waterfront, and the fairness of the purchase price23. The motion was passed by members, the site was bought by the Club, and planning work could start. 36The architects selected were the well-established firm of Palmer and Turner. They designed a grand structure which, holding its own on the east side of the new Square, would mirror and balance the dignified façades of the Queen’s Building and of the Prince’s Building opposite, and of the Bank to the left. They were given orders to have the work completed in time for the Diamond Jubilee Celebration. And, true to their word, and for a fee of £15,000, they delivered the splendid new building just in time. And so, on 28 July 1897, as the Jubilee festivities were in full swing, Hong Kong’s colonial elite proudly took possession of its new Club house. From the brand new stone balconies, they paid homage to Queen Victoria, enthroned in bronze under her imperial canopy, and nodding her royal approval at the way her subjects had so spectacularly improved what once was a “barren rock” and turned it into a magnificent harbour-city. 38Thus, by the end of the Diamond Jubilee celebrations, Statue Square was still very much a work-in-progress with only three completed buildings around it – the City Hall (1869), the Bank building (1887) and the brand new Hong Kong Club House (1897). There remained three large vacant lots ready to accommodate three more buildings. Two were to be erected on the west side of the Square – the Queen’s Building (1899) and the Prince’s Building (1904). The third lot, to the east side of the Square between the Bank and the Club, belonged to the government. And in 1898, following the successful Jubilee celebrations, the government decided to build a new Supreme Court Building on this site. 25 S. Bard, Voices from the Past, op. cit., 298. 39It is hard to resist seeing the unintended symbolism of this decision: what indeed could have been more appropriate than to build the Supreme Court on this “level playing field” only just reclaimed from the sea? Of all the splendid buildings which finally surrounded the new Square, the domed Supreme Court is probably the most dignified and ageless in its grand classical design. The others had been financed by private subscription and private capital but this was a public building and it had to be financed by the public purse. It therefore took longer to complete, and the ceremonial opening of the new Supreme Court only took place in 191225. Wiltshire (1997), Vol. 2, p. 72. 40In a way, it was only with the completion of the Supreme Court that the open space which Queen Victoria’s monument had once and for all designated as the heart of the city of Victoria, became really Statue Square. By then it had all the traditional ingredients of a city square: a central focal point, statues of national icons26, green spaces, and a lining of prestigious buildings. The appearance of the Square was to remain unchanged until the 1930s, when the Bank enlarged its headquarters and the Old City Hall was demolished to make room for it. 41Successive phases of reclamation have now pushed the city’s harbour-front ever further north, and the three-storied buildings of old have been replaced by sixty-floor skyscrapers. In the midst of this change, Statue Square has managed to endure to this day – a still vibrant relic of the late Victorian era. 42At the end of this fifty-odd-year journey through the historic evolution of the Central District of Hong Kong, we are in a position to draw some modest conclusions about the society which made that evolution and its architectural achievement possible. That society was the ruling elite of a British colony, and the Central Square it left behind for future generations to enjoy tells us something about how colonial government tended to work, and about the peculiar British flavour which permeated the whole social fabric of the day. 43One of the first things which strikes the observer of the process which eventually gave rise to Statue Square is its unplanned nature. The Square just seems to have happened over time, like Empire itself, “in a fit of absent-mindedness”. No central authority was in charge of creating what usually demands careful and long-term planning – a public square. The colonial government responded pragmatically to various sets of circumstances, with a constant desire to increase its revenue rather than contribute to its depletion. Hence its agreement to Paul Chater’s grand reclamation scheme, as well as its slowness in completing the Supreme Court building. Even on imperial occasions like Queen Victoria’s Jubilees, the colonial government was totally in favour of pomp and pageantry so long as it did not have to pay too much for it: hence, the private subscriptions for the commission of the Queen’s statue, and the great usefulness of a Paul Chater as maestro-orchestrator of the whole celebrations. And when the government took the lead, as it did when it struck the open space deal with the Hong Kong and Shanghai Bank, it was almost as an after-thought. 44The case of Paul Chater himself is also instructive. Whatever else the long awaited biography of this remarkable Victorian may one day reveal, it is plain that he was the antithesis of a “home grown” product. An Armenian from Calcutta, he never went to Eton or Oxford. But he had great talent for making money both for himself and for those around him, and as a result he was soon accepted in the elite society of colonial Hong Kong. He became a close adviser to governors, and the bold reclamation project he promoted and the real estate boom which followed its completion created more wealth for members of the establishment as well as for the rising elite of Chinese merchants than had ever been seen before in the colony. This supposedly closed Victorian society, which was thought to be even more impenetrable to outsiders in a colonial context than at home, was thus a lot kinder to the upwardly-mobile than may often have been realized. The movers and shakers of the day could gain the ear of government, regardless of their origins and backgrounds, so long as they conformed to standards of accepted morality and were seen to contribute to the general well-being of society. 45Finally, in a place like Hong Kong, influence in the colony at the turn of the twentieth century was almost synonymous with membership of the Hong Kong Club. In spite of their natural rivalries, all the heads of the important British merchant houses and of the companies they controlled were members of the Club. Their bank was the Hong Kong Bank. They all owned shares in the Hong Kong Land Investment & Agency Co. which had sizeable investments in the Queen’s Building and in the Prince’s Building. And, when their disputes were really serious, they instructed Queen’s Councils (also fellow Club-members) to fight their cases in the Supreme Court. Influence in Hong Kong was wielded around Statue Square. In order to exercise it and to perform the necessities and duties of their professional lives, all they had to do was to cross Statue Square in one direction or the other and to find in its various buildings all that they could possibly wish for – good food, good wines, good legal advice, good bank loans, and, in the evening, at the City Hall, good performances of Gilbert and Sullivan. 46Enthroned in the midst of this conveniently confined agitation, serene on its imperial throne, Queen Victoria’s statue watched over the city. Yes, through the potent combination of private enterprise sometimes verging on greed, government benevolence sometimes verging on acquiescence, naval supremacy and English Law, much had been achieved by her dear subjects in this little corner of the world, once a mere shelter for pirates and penniless fishermen. BARD Solomon, Traders of Hong Kong: Some Foreign Merchants Houses, 1841-1899, Hong Kong: Urban Council, 1993. BARD Solomon (ed. ), Voices from the Past – Hong Kong 1842-1918, Hong Kong: Hong Kong University Press, 2002. DAVIS S. G., Hong Kong and its Geographical Setting, London, Collins, 1949. EMPSON Hal, (ed.) Mapping Hong Kong, Hong Kong: Government Information Services, 1992. HO Pui-Yin, Challenges for an Evolving City, 160 Years of Port and Land Development in Hong Kong, Hong Kong: The Commercial Press, 2004. HONG KONG CLUB (ed. ), The Club, Special Commemorative Issue, 1897-1981, Hong Kong: Kong Kong Club Publications, 1982. HUDSON Brian James, Land Reclamation in Hong Kong, unpublished PhD Thesis, University of Hong Kong, 1970. HURLEY R. C., Handbook to the British Crown Colony of Hong Kong and Dependencies, Hong Kong: Kelly and Walsh, 1920. LAMBERT Ian & Gillian CHAMBERS, One Queen’s Road Central, The Headquarters of the Hong Kong Bank since 1864, Hong Kong: Hong Kong Bank, 1986. SAYER Geoffrey Robley, Hong Kong, 1841-1862, Birth, Adolescence and Coming of Age, Hong Kong: Hong Kong University Press, [OUP, 1937], 1980. ------, Hong Kong, 1862-1919, Years of Discretion, Hong Kong University Library, Photocopy of the original manuscript available under catalogue No. : HK.951.25.S27h. TREGEAR T. R. & L. BERRY, The Development of Hong Kong and Kowloon as told in Maps, Hong Kong: Hong Kong University Press, 1959. WARNER John, Fragrant Harbour, Early Photographs of Hong Kong, Hong Kong: John Warner Publications, 1976. WILTSHIRE Trea, Old Hong Kong, Hong Kong: FormAsia, 1997, Vol. 1 and 2. 2 Ian Lambert & Gillian Chambers, One Queen’s Road Central, The Headquarters of the Hong Kong Bank since 1864, Hong Kong: Hong Kong Bank, 1986, 30. 3 Hong Kong Club (ed. ), The Club, Special Commemorative Issue, 1897-1981, Hong Kong: Hong Kong Club Publications, 1982, 1. 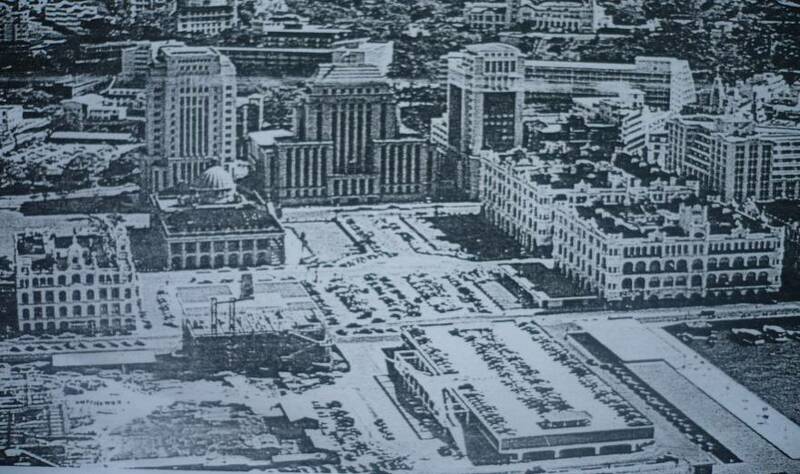 4 In the 1960 photo, the 1935 enlarged bank building has replaced its 1882 predecessor, and the old City Hall building, dating from 1869, had been pulled down to make room for the enlargement. 5 Originally, the name “Hong Kong” referred principally to the island on the north shore of which the harbour and the city of “Victoria” developed. Nowadays, of course, Hong Kong refers indifferently to the city itself, or to the island, or even more broadly to the whole area covered by the Chinese administrative entity known as the “Hong Kong SAR”. 7 Pui-Yin Ho, Challenges for an Evolving City, 160 Years of Port and Land Development in Hong Kong, Hong Kong: The Commercial Press, 2004, 36. See also John Warner, Fragrant Harbour, Early Photographs of Hong Kong, Hong Kong: John Warner Publications, 1976, 48. 9 On the visit of Prince Albert, Duke of Edinburgh, see J. Warner, op. cit., 154. The subsequent royal visitors during the Victorian period were: in 1880, Prince Henry, a German grandson of Queen Victoria; in 1881, Princes Eddy and George (the future King George V), then cadets on the HMS Bachante; and, in 1890, (more importantly for the history of Statue Square), Prince Arthur, Duke of Connaught, who laid the foundation stone of the Chater reclamation (which will be described below); and again, in 1907, when he returned to see the completed Statue Square and the array of proud buildings on the new waterfront. 10 On the original City Hall, see J. Warner, op. cit., 11-13. 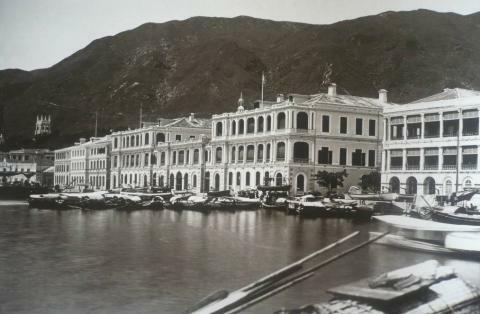 The building was financed by subscriptions from the elite community, most of whom where members of the Hong Kong Club. According to Warner, the architect who designed it was a Frenchman called Lhermite. The information may well be correct, though I have not yet been able to verify it. 12 Surprisingly, in spite of Chater’s historical importance in the urban and financial development of Hong Kong, no biography has yet been written about him. Only short summaries about his life and career have appeared in various books, e.g. in Solomon Bard, Traders of Hong Kong: Some Foreign Merchants Houses, 1841-1899, Hong Kong: Urban Council, 1993, 95-96. Paul Chater (1846-1926) had a long life. He was born in Calcutta to an Armenian family with a long trading tradition. He arrived in Hong Kong at the age of 20, worked briefly as a bank clerk, and then quickly started his own bullion business. He soon branched into real estate, and became the most successful Hong Kong developer of his day, accumulating a vast fortune in the process. In 1887, he became a member of the Legislative Council and, in 1896, of the Executive Council. He was knighted in 1902 for his contributions to the advancement of Hong Kong. Later in life he became known for his philanthropy and public benefaction. 13 Brian James Hudson, Land Reclamation in Hong Kong, unpublished PhD Thesis, University of Hong Kong, 1970, 137. 14 P.-Y. Ho, op. cit., 76. See also S. Bard (ed. ), Voices from the Past – Hong Kong 1842-1918, Hong Kong: Hong Kong University Press, 2002, 206. 15 HK$ 2,895,831 to be precise. See P.-Y. Ho, “Praya Reclamation Scheme Expenditure and Valuation (1889-1903)”, op. cit., 73. 17 From the Archives of the French Foreign Missions in Paris. The Queen’s Building was completed in 1899, and the Prince’s Building in 1904. See S. Bard (ed. ), Voices from the Past, op. cit., 277. 18 For a history of the bank and more particularly of its presence in Hong Kong and of its headquarters building, see I. Lambert and G. Chambers (op. cit.) which is the source of the quotations in this section. 24 Ibid., 10-11. The caption for this picture reads: “The celebration of Queen Victoria’s Jubilee in 1897 showing the monument to the Queen at what is now Statue Square. 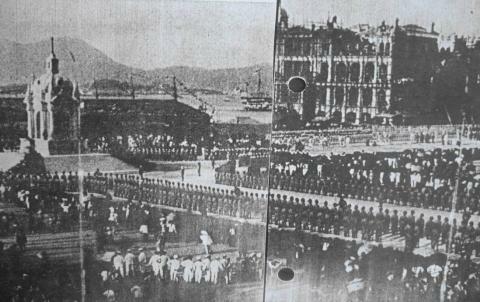 The Hong Kong Club building on the right nears completion.” But, as is made clear by the following extract from the Hong Kong Weekly Press and China Overland published on 29 July 1897 which recorded the events of the previous day, the caption is incorrect in its date and the photo must predate the Jubilee celebration by a number of months: “Today [28 July 1897] the members of the Hong Kong Club take possession of their magnificent pile of buildings recently erected on the sea frontage. […] The new Club stands in a commanding situation of the Praya and there is an unobstructed view of the harbour on the north side, and on the Peak on the south. […] A grand staircase, made of teak, leads from the first to the second floor, […] On this floor is the library, which faces the Queen’s statue”. 26 Amongst the statues of royalty in Statue Square was also one statue of a commoner - Sir Thomas Jackson, the long-serving general manager of the Hong Kong and Shanghai Bank. Today, his statue is the only one that remains on Statue Square. During World War II, the Japanese shipped home all the bronze they could lay their hands on in Hong Kong, including Queen Victoria’s Statue. It was to be melted in armament factories. After the War, however, the statue of Queen Victoria was recovered intact and returned to Hong Kong. Later, it was installed on a pedestal in a large public space appropriately named “Victoria Park”. During the past twelve years since the 1997 handover of the former British colony to China, Victoria Park has periodically been the rallying point for hundreds of thousands of Hongkongers whenever they want to show their disapproval of government decisions in silent vigils or peaceful protest marches. Alain Le Pichon, « In the Heart of Victoria: the Emergence of Hong Kong’s Statue Square as a Symbol of Victorian Achievement », Revue LISA/LISA e-journal, Vol. VII – n°3 | 2009, 605-625. Après avoir enseigné au college d’Eton, puis fait une carrière dans la finance en Angleterre, aux Etats-Unis et à Hong Kong, Alain Le Pichon est aujourd’hui Maître de Conférences à l’université de Paris-Sorbonne (Paris IV). Son travail de recherche porte principalement sur la période coloniale de la Grande-Bretagne et la présence britannique en Inde et en Chine. A la demande de la British Academy, il a publié une édition des lettres des fondateurs de la Société Jardine, Matheson & Co. sous le titre China Trade and Empire, OUP, 2006. Il poursuit actuellement ses recherches sur le travail des missionnaires des Missions Etrangères de Paris en Chine et à Hong Kong. Un premier volume est paru sous le titre French Secrets from a British Colony, Hong Kong APA, 2006.